I’ve developed some really great friends here in the blogging world. No one is more loyal than Chuck. He champions his friends at every opportunity. No matter how lame my post, I can always count on an encouraging comment from Chuck. He’s enjoyed my books and even passed them along to friends. (And claims he’s read them more than once – God Bless you, man!) Chuck always has my back – and I’ll always have yours, dude. I’ve only known Brinda since last fall, but she at once jumped in with support for others. She’s usually one of the first to comment on my blog. (Not an easy feat! Competition is so fierce right now.) She’s quick to comment, quick to respond, and quick to help out others. Brinda, you are going to go far with that awesome attitude! Several Challenge participants are posting excerpts or short stories. One of the best I’ve seen so far is Christine Rains’s ongoing story. You’ll have to go back to her A post to catch up, but it’s worth it. I feel like a junkie looking for my fix every morning. What will happen next to Abby? I’d also like to take this time to thank my Ninja Army. You guys have been wonderful in seeking out the bloggers I’ve recommended and following them. Thanks, I really appreciate that! To my new followers, welcome! I hope to visit everyone after the insanity of the Challenge. 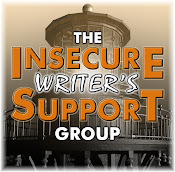 For those who are writers, I invite you to check out the Insecure Writer’s Support Group. And big thanks to Geof at The Man Cave for an awesome review of CassaFire! Folllowing Chuck and Brinda? Fan of Firefly? (Feel free to share your evil thoughts about FOX.) Have you been following Christine’s story? What’s the best story you’ve read here so far? Who in your life is loyal? And who is going to see Cabin in the Woods this weekend? I’m hitting it this afternoon…. Awesome blogger Alex. Yes, it's been great how many short stories or flash fiction there is this time. We are also writing flashes at RomanticFridayWriters. Anyone interested? I have trouble getting readers as my pic links to L'Aussie Writer. Ooooh I'm number 2! YAY! ALlex your posts are never lame! Oops maybe it's too late for me. Sorry for the typo Alex. All new folks for me this time around. Guess I'll be making the rounds. Thanks for sharing more cool people. Why am I again the second commentor? I have to shed this bad habit of coming second again and again. Alex, you have many loyal supporters and its all to do with your friendly and generous nature. Oops, by the time my comment appeared there were several more comments. Sigh. Chuck's the kind of guy whose warm friendship is evident from the get-go. I will visit Brinda - don't think I've done so yet. Thanks again. Ooh, Mal was my favorite character. Great show. Stupid, stupid Fox. Drat! I am not first this time. I plan on going horseback riding this weekend. So no Cabin in the Woods for me. Will check out your pals as always, Alex. Brr. What about the freeze in NC? And it is below freezing tonight too. I am totally hooked on Christine's story, I get so excited for it every day lol! I was hoping Brinda would be first. That'd be awesome! Lol. Mmmkay, I need to watch me some Firefly. I feel a major nerd fail on my part with this one. Maybe Comedy Central will pick it up like they did with Futurama. Ah, let us know how much of a game changer Cabin really is. I've been to Chuck's place on a few occasions... the man is larger-than-life... priceless! I've never seen Firefly, but I keep hearing good things about it. I just bookmarked it on Amazon instant video. I think I am number 19 today to comment. I shall have to stay up all night to be the first....now that's loyalty for you. Love the blog links will certainly look them up after the challenge. I'm twenty I think, but that is pretty good for me. I am on a different time zone from some bloggers. I have visited Brinda previously and she is as you say Alex - always ready to support a fellow blogger! There's nothing like a loyal blogger. There's so much support out there. Nice to see people get recognized. D'oh - I've been so busy jumping around with the A-Z that I've been forgetting to check out the bloggers you highlight! Going to do some catching up. Denise, I'm just not the romantic type I'm afraid. KM, thanks and no worries on typos. Rachna, you have to be really fast around here. And thank you very much. Robyn, Chuck is just an awesome dude. Jaycee, don't get me started! Robyn, bring on the cold weather. Less bugs! Roland, those guys are clueless. Cassie, wish someone would renew it! Yvonne, appreciate that you try! Nick, get with it man! Great fan of Firefly and subsequent movie, Fox were idiots! More new people to follow! Off I go! I'd have to get up at midnight to be the first commenter on today's post. You have lots of loyal followers, but thanks so much for the awesome shoutout. :) You are a loyal follower as well and I'm lucky to know you. I'm a big fan of Brinda and of Firefly. Congrats on anyone who might be first - you should make some sort of prize for it. A badge or some thing. Just seems funny to me for some reason. I agree with Rusty. You should have a badge that says "First commenter on Captain Ninja's blog" or something. I LOVE Firefly and watch it over and over again.Truly awesome show. Thanks for sharing more awesome bloggers and writers! I love this theme. I'm on my way to check out Brinda. And I loved Firefly & was pissed off too when they canceled it. How could they do that to Whedon? Jeez!!! Brinda is another one of those blogging ninjas, just like you. Such a small and yet powerful word. Loved reading your thoughts and offerings today. There's this really interesting article on the BBC stie about the Cabin in the Woods movie trailer - as apparently it's given away the twist in the story! LOL! So whatever you do - don't see the trailer!! Who is loyal in my life? Charlie! Well - until a nice neighbour shakes a treat at him..!! Fox waits until I get interested then pulls the plug on fave programs. The dirty rats. Add Lie To Me to that list. Just a quick question - will the A-Z blog list still be available after April and the Challenge is over? I would love to continue to work my way through all of the awesome blogs there. Loved Firefly (and Serenity). Yeah, don't get me going. Brinda, thanks and you're welcome. Rusty and Laura, I might have to do that. Jemi, I have the series on DVD as well. Mina, it was a crime. Kitty, I won't let anyone spoil it for me. Teresa, there are a lot of writers. Carrie, it will remain up at the main A to Z Blog! Thanks, everyone! Glad you're enjoying my theme. I'm following, yes I am! And I love all ONE season of Firefly! Now I just have to be satisfied watching hunky Nathan Fillion on Castle. Oh, you know I'm a fan of Firefly so I was thrilled to see Malcolm Reynolds on your blog this morning. No one embodies loyalty better than Captain Tightpants. Chuck's the man. His blog is always entertaining, and he's had some of the best headers. With most bloggers I rarely even pay attention, but he's got some magic pertaining to headers. Cabin in the Woods should be great. Chuck and Brinda are amazing people and I like to visit their blogs. Thanks for highlighting them today! Firefly is another head scratcher and you have to wonder why great shows like this get the ax and other shows remain running. Simply amazing. Definately will check out the blog suggestions. My computer is running so slow this am. I am following several whose stories continue the next day! Well, I reviewed Brinda's first book in the series and should be up on my blog today. I follow Chuck but haven't commented much, read and always think of coming back with a brilliant comment later which sadly never happens. 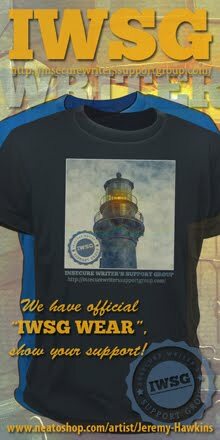 I think my blogger friends have been loyal these 1 1/2 years, more than expected. Loyal blog friends are the best! Firefly was an awesome show. And I love Christine's story. I keep telling her she needs to publish it. After all, she already has a free editor/formatter (moi) to help her. I've also really enjoyed Rachel Morgan's Creepy Hollow creatures. The assignments are fun, and I love the YA voice. My dog is loyal. Not too bright, though. I'm pretty eager to see Cabin in the Woods. I think I'll need to get there quick, before I come across any spoilers. Loved Firefly! As for who in my life is loyal... my husband, my sister, my dog and a few choice friends. *Fistbump to Geoff* And Brinda is awesome. And lucky me just had Christina beta read one of my mss and she was an amazing help! What an amazing network we have here! Both great blogs. Firefly was the jam and Mal was a true hero. I had a hard time keeping up with the episodes too when it was on the air. TS, and he likes to change them up. Rekha, Brinda will appreciate that. Rick, most dogs aren't too bright, but they are loyal. I think we all need bloggy friends, I know I cherish mine. Firefly, I discovered it after it was cancelled but of course I watched every episode dang near back to back! Yup, I'm following Christine's story. Can't imagine the work involved with putting that together. Wish they'd bring back Firefly. It was such a fantastic show. I wuv you Ninja! And your little news too!!!! Thanks for dropping by this morning! There's an internet meme going around that is completely in sync with what you're saying about Firefly's untimely demise. It has something to do with the fact that Jersey Shore somehow made it to Season 5. Chuck and Brinda are great, and very recent finds of mine. And I was wondering what I should watch over lunch today...I think it will be the pilot episode of Firefly now. I'm so glad you put Mal on the list. He was, in many ways, a scoundrel, but he is one of the most loyal characters ever written. I'm so jealous! I want to see Cabin! I'll get there...eventually. Thank you for all your support as well! Brinda is a lovely person. Until proven otherwise I think I have many loyal friends, but I have also known unfair. I guess I'll do for some and for others I will not. FOX used to be cool. Who in my life is loyal? I have some of the best possible friends, but in terms of the blogosphere, I'd like to nominate you, Alex, as the most loyal! Not only do you comment on each post, but you're usually the first one! Libby, and that's a fun way to watch them! Jeffrey, and that is a total mystery to me. Leigh, I also own several computers. Don't hit me! Heather, another movie would be great. But would River still be crazy? Thanks, Hart. And not a chance in Hell a naked guy is appearing on MY blog! I've been reading Christine's story, and it is super. She must be thrilled that you mentioned her. It's nice to see how others interpret the A - Z Challenge. I'm really enjoying the challenge, because it's forcing me to relive parts of my trip to Paris. I love seeing the pics that others are posting, too. And Anne Gallagher's character series is also very good; I like seeing her picks for character inspiration in her books. I'll check out the blogs you mentioned . . .soon. I'll jump in on the Brinda love! She's amazing. One of my favorite bloggers, too. Oh, I love Christine's story! I'm totally wrapped up in it. On April 1st I fell for the prank that Netflix had bought the rights to Firefly and the entire had signed on for a second season. They got me good. My Mom's support group is loyal. Also, my publicist Krista. She's always there for me in every way. I didn't know Chuck. Off to follow! Brinda is awesome. I'm lucky to call her a friend! Time to meet Chuck :). DG, there are just so many great themes this year. People really put effort into their posts. Loved Firefly! And you are an awesomely loyal blogger Alex! I'll check out your links. Loyal is THe perfect word to describe you, Alex. Gosh, I don't know how you still manage to leave comments on my blog despite your busy schedule! I can barely keep up with the A-Z :P You are my blogging idol! I totally agree with what you said about Chuck! I like both him and his blog...a lot! I love short story excerpts. I'll have to go check that out. I am totally loving the ongoing stories too. I am addicted to Jen Chandler's. I will have to check out Christine's. It has made me realize that when I think I don't have time to get to my TBR books...I should just read a couple pages a day. :-) Enjoy those leisure moments this weekend! Thank you, Nutschell. Just doing my best. Tracy Jo, just takes a little time. Thanks for reminding me about Apocalypse Now -- it's a blog I used to visit regularly and then spaced out. And loyalty is such a ninja trait. I also met Brinda last fall. She is awesome and I am so happy to know her. I'm enjoying all the A-Z posts. Firefly was a really good show. Its hard to figure out why it got the chop. Brinda is fab. Will have to check out the other one. I still miss Firefly. Everyday. Sniff. Angela, Chuck is the man! No movies for me lately, I would like to go see it, maybe next weekend. Of course, I still haven't had a chance to see The Hunger Games so IDK. Love firefly...Another great A to Z post. Looking forward to checking out these blogs! By hub's request, The Three Stooges are up this weekend. Hope you have a great weekend. How the "L" are you? As one of your loyal starstruck fans, it heartens me to know that you have developed some really great friends within the sharing, caring blogging community. I can sense the Love that emanates from here. We are 'electric friends' and the 'electronic tonic' we share, is a positive charge for a kinder, more caring world. I love Christine's story! There is some great fiction being produced for the Challenge. I'm a huge Firefly fan. It is amazing to me it was cancelled. My husband is loyal - he would die for me. Chuck's pie charts ROCK. And so does Firefly! Hey Alex - Loyal is a great L word. You're personify that. I sure appreciate you. Hope your weekend is awesome! Oh, Mal! So great. Of course, when I think of loyalty in literature, my mind automatically goes to Sam from LOTR. Like the folks you singled out. What a following you have!!! I get so overwhelmed reading your posts. I feel like I am missing so much in the blogosphere and stuff. I need to quit my job and focus on blogging. I think it's more important. I'm blushing. Thank you for mentioning and linking me, Alex. You fit the the letter theme today too. I hoped a few people would like my story for Challenge, but I've gotten such a great response. I just got in an hour ago from my trip. I'm exhausted and happy to be home. I have a lot of catching up to do, but I'm excited about catching up on the Challenge with everyone. Christine's story is awesome, I'm just getting caught up now. Thanks for highlighting another great blog, Alex. Love Firefly, and Mal is awesome. Flawed but loyal. Loyalty is definitely a trait I value. And I tend to be loyal to a fault myself. Until you burn me; then I become a biotch and it's hard to earn back my trust. Thanks for sharing! Good luck with the rest of the challenge! I'll have to head over and read Christine's story. I know Brinda, but not Mal. I'll have to head over there too. Thanks. Alex, as soon as I opened my blog today I knew something was a foot. There just don't ever appear 26 comments in one day. I suspected (and was confirmed as I read the comments) that you had a hand in it somehow. Thanks again for the mention and the follower boost! No claim my man, true fact...I read CassaStar twice. I know I will read CassaFire a second time as well. You KNOW how good I think they are (psst one word - movie!). Thanks again for everything and I hope you enjoy my M post! goodness, 118 comments! I think I'll just go and cry myself to sleep. Loyal is a lovely word to use for L. Just reading up a few comments there, and I'm with Powdered Toast Man, I'd have to give up everything else in my life to keep up with your gruelling blogging and commenting schedule. You do an amazing job Alex, and deserve your Loyal following! What's Cabin in the Woods? How do you find the time to see a movie, hold a job, and do all the commenting you manage to do? yep, I'm a Firefly fangirl, I admit it! PTM, wait until after you're married so you have some financial support. Christine, your story has been awesome! Chuck, you are most welcome. You the man! I really need to watch Firefly sometime. People always say how awesome it was! Chuck is awesome, and Christine's story has me hooked. A single season of FIREFLY is one of America's greatest tragedies. We all have FIREFLY t-shirts in our family and do a marathon every summer. I'm still not over Wash's demise. Oh how I miss Firefly! They had the best set-up to keep that show going forever!!! Great set of characters, and basically a universe full of stories. Sigh. And, like you, you don't want me to rant about FOX...their news OR their cancellation of the greatest show ever.